In almost every situation, there are positives that come from things that go bad. For the Houston Astros, let's just say they've known bad for quite some time and leave it at that. But with that has come a crop of high draft picks and big-time prospects that has resulted in a bright future and a World Series title. 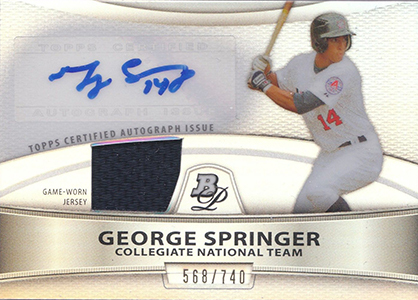 Collectors have plenty of George Springer cards to keep tabs of from even before his major league debut. 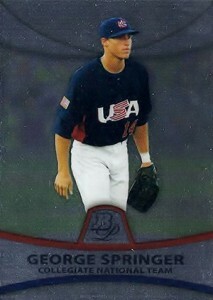 George Springer cards date back to 2010. 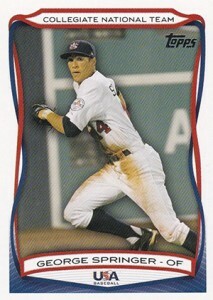 He appeared in several sets thanks to his involvement with USA Baseball. Several more cards followed in 2011 following the draft. 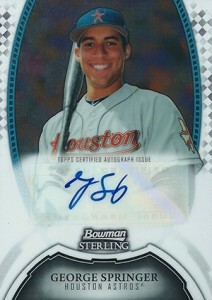 This includes what most consider to be the top George Springer card, the 2011 Bowman Chrome Draft Prospect Autograph. 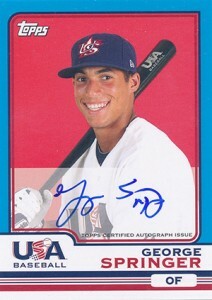 See Also: Complete George Springer Rookie Card Guide. All George Springer cards released prior to his MLB debut are either inserts or come from prospect sets, which means they're considered by most not to be rookie cards. Those came in 2014. That said, many of his early cards are still highly respected in the hobby, particularly those that show Springer in his Astros uniform. 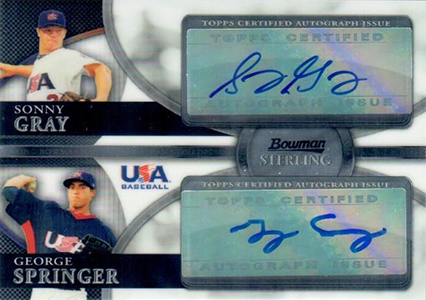 Here's a look at some of the key George Springer prospect cards issued before he was called up by the Astros. This isn't a definitive list. Rather it highlights his top cards and where to find them. The only way to get this card was through a 2011 Bowman Chrome wrapper redemption. Numbered to 99, it's one of his tougher early cards to find. Given the brand's pedigree, it's also one of his most popular national team cards. While autographs and relics get a lot of the attention when it comes to the first George Springer cards, there are some basic cards as well. 2010 Bowman Platinum is one of them. Featuring a foil design, it's very affordable. There are also several Refractor parallels to chase. They also pop a lot more than the dull base version. Numbered to 740, there's no shortage of the 2010 Bowman Platinum George Springer autographed relic. Featuring a Refractor finish, it comes with a swatch from a USA Baseball jersey. The higher print run should keep prices in check. 2010 Bowman Platinum Dual Relic Autograph George Springer #BS #/99 with Jackie Bradley Jr. 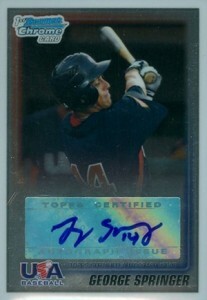 This card pairs Springer with one of his teammates who has also gone on to the majors, Jackie Bradley Jr. Both players have a sticker autographs from both players as well as USA jersey swatches. This is another card that matches Springer up with one of his teammates, this time pitcher Sonny Gray. The trend of sticker signatures continues, which is unfortunate. But it's tough to ignore the pairing. Included as part of a factory set, this is easily one of the most affordable early George Springer cards. It's also one of the few with a large action photo. You should be able to find this card for very little thanks to its lack of gimmicks and upgrades. 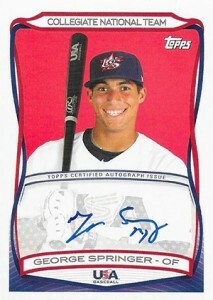 2010 Topps USA Baseball factory sets came loaded with autographs and relics. Basic autograph cards come with on-card signatures, a major plus when you line it up with his other 2010 cards. It's also relatively affordable and not terribly difficult to track down. If hits are your thing, this one has a lot going on with an autograph and a trio of jersey swatches. Numbered to 219, it's somewhat plentiful given the niche appeal of national team products. Granted, the plain colors aren't the most exciting. A patch parallel numbered to 50 adds some sizzle. This wasn't included in the 2010 Topps USA box set. Rather, it can be found in 2010 Topps Chrome Baseball. The blue borders are bold and the on-card signature is a big selling point. And while it's not a fancy signature, it's a little more intricate than the one it quick devolved into, even a year later. 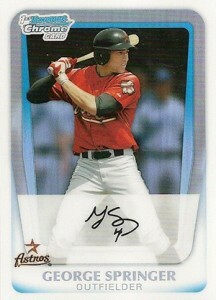 Part of the Prospects inserts, this is the first George Springer card to feature the outfielder in an Astros uniform. While many collectors pay attention to the autographed version, this one is something that all collectors can afford. Several Refractor parallels add a chase element for those who want something a little more. 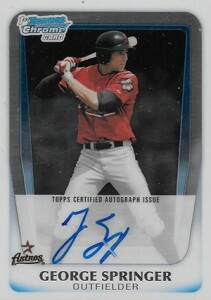 If you're looking for a cornerstone George Springer card, the 2011 Bowman Chrome Draft Prospect Autograph is it. While it's obviously not his first signed card, it is the first to have him in a MLB uniform. 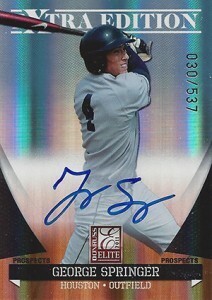 There's also the brand familiarity of Bowman Chrome. As an insert it's not an official rookie card, but many collectors treat it like one. Besides the basic version, there are multiple Refractor parallels. 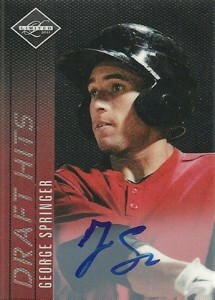 Strangely, the base 2011 Bowman Sterling Geroge Springer is tougher to find than the autographed version. That's because the product is big on signed cards and regular cards are largely ignored. If autographs are out of your price range, this is a sleeper worth considering. 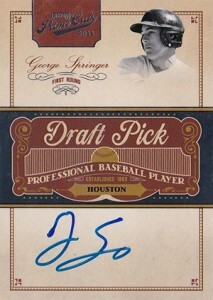 This is a more affordable alternative to the 2011 Bowman Chrome Draft George Springer autograph. Sterling doesn't carry the same clout as Chrome. This card also uses a sticker for the signature. 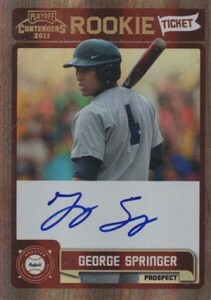 But if you're big concern is getting an early MLB autograph, this card has it. 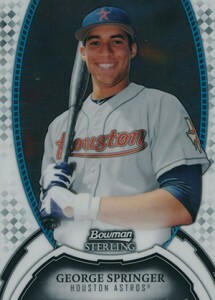 While Springer is shown in a generic uniform, 2011 Donruss Elite Extra Edition does have some things Bowman Chrome doesn't. It's numbered, which appeals to some collectors. It's also much more affordable. Another card done with chromium card stock, the big draw of 2011 Leaf Metal Draft is the price tag. They're more affordable than the Bowman Chrome cards, in large part due to the lack of licensing and logos. However, the Refractor-esque Prismatic parallels have gained some traction among some prospectors. 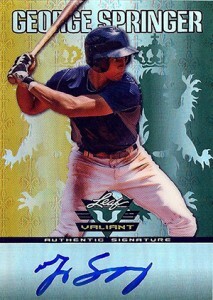 A throwback to the 1990s Donruss Crusade cards, the 2011 Leaf Valiant George Springer is certainly colorful. It comes with a reflective surface as well as an on-card signature. Parallels come with different color combinations and serial numbers on the back. 2011 Panini Limited took a major dive after it was released. For collectors more concerned with autographs and rarity over logos, this could be a solid choice. It's a more affordable option, even with its smaller print run. Pretty much the exact same can be said for the 2011 Playoff Contenders as with Limited. 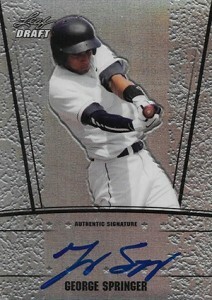 And while it has the popular "Rookie Ticket Autographs" name, the design on the front tells a different story. This one is probably for George Springer fans or those who just want an autograph and don't care what it looks like. Limited to 249 copies, it's not the easiest card to find. It also comes from a set that isn't overly popular. With such a small shot the the outfielder, few are likely to like the look of it. But it does have an on-card signature going for it. 2017 Topps Now #296 GEORGE SPRINGER ASTROS Only 182 Printed! 2019 Topps "Living Set" Card: George Springer Houston Astros #130 Only 3541 SSP! i have a topps 2014 of GEORGE SPRINGER card # 318 at the top it says TOPPS FUTURE STARS AT THE BOTTOM TOPPS ALL STAR ROOKIE SHOULD I HANG ON TO THIS CARD? George Springer 2014 National Treasures Made In USA Rc Auto # 99 BGS 9.5 Gem MT!